Enceladus is a moon of Saturn. Although Enceladus is tiny (only as large as the British Isles! ), there are spectacular geysers of water near its South Pole, which feed one of Saturn’s rings. There is a good chance that the water comes from an ocean beneath the icy surface of Enceladus. This ocean likely surrounds a rocky core through which water can circulate. Direct measurement of plume gas and ring particles from the Cassini mission have revealed the presence of organic molecules, as well as products of the chemical reactions between rock and liquid water. 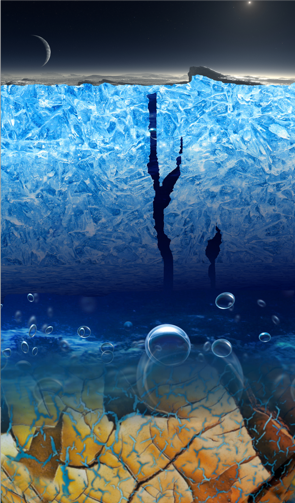 On Earth, wherever such organics and chemical reactions in liquid water occur, there is life. Is there also life inside Enceladus? 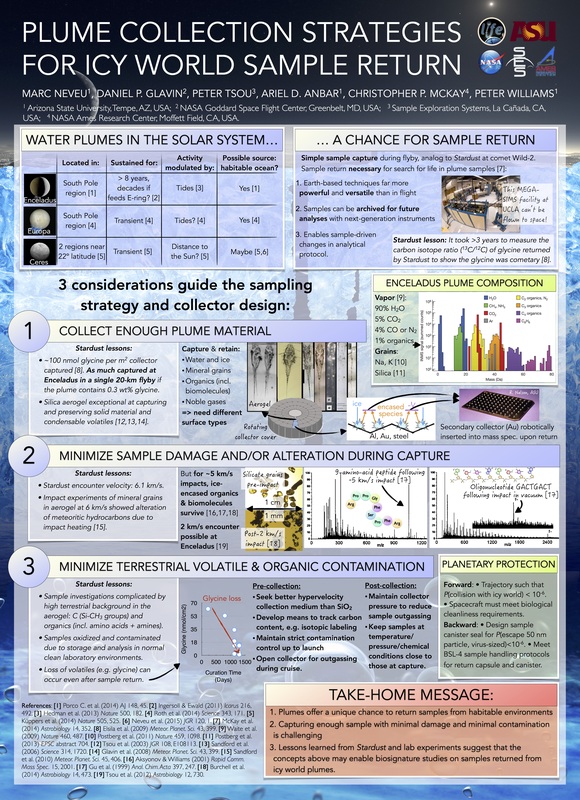 One quick and easy way to find out is to send out a spacecraft to fly through the geysers, sample plume material, and bring it back to Earth for analysis. The LIFE (Life Investigation for Enceladus) mission concept proposes to do just that. Want to know more? Check out the poster below and this conference abstract. In the past decade, several researchers have independently reported the discovery of methane in the atmosphere of Mars. This is a big deal for the question of life on Mars, because on Earth, besides human emissions, methane comes either from microorganisms called methanogens, or is produced by active reactions between water and rock that create habitats. In 2016, a spacecraft will orbit Mars and try to confirm the detection of methane. My goal was to develop an instrument that maps the methane in Mars’ atmosphere, to understand if there are “hot spots” where it is actively released, and if that changes over time. The instrument I helped develop is called a gas correlation radiometer. It measures how much light is absorbed by methane molecules, which allows to tell how many of these molecules are present. Besides methane, it can measure other gases important to our understanding of the geology, chemistry, and possible biology of Mars. This instrument can also be adapted for missions to other planets with atmospheres, such as Venus or Titan, a moon of Saturn. Want to know more? Check out this instrument paper and this conference paper. To function, spacecraft need power, often provided by solar panels. They need to dissipate heat from the Sun using radiators. Spacecrafts also need cameras with clean lenses. However, satellites have blankets, pieces of tape, and glue that all tend to outgas under the vacuum of space and solar radiation. Outgassing of plastics and glues is what you experience when you notice that new car smell. 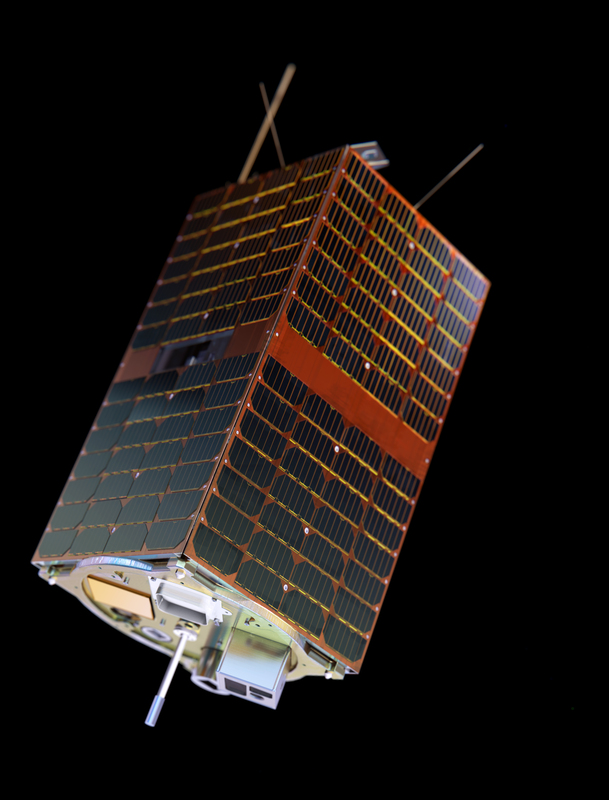 Because of outgassing, satellites are surrounded by a cloud of plastic and glue organic molecules that get deposited where we don’t want them: solar panels where they block sunlight, radiators where they prevent heat from being radiated away, and camera lenses. One satellite even stopped working because of this molecular contamination of critical surfaces. To prevent that, engineers carefully choose spacecraft materials, monitor contamination on Earth as spacecrafts are built, and (rarely) count molecules deposited in undesirable places once in space. 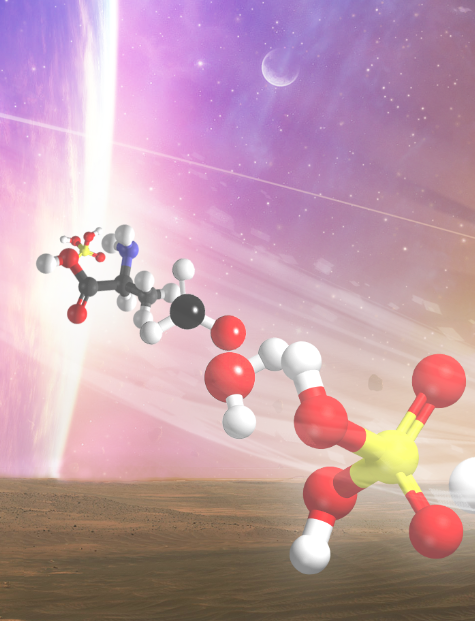 My goal was to come up with a way to not only systematically measure the amount of contamination on spacecraft in space, but also to identify which molecules were responsible and where they came from. I researched how to miniaturize techniques such as gas chromatography, infrared fiber- and mass-spectrometry, and vibrating micro-cantilevers coated with molecular recognition layers to count and identify these organic molecules. The European Space Agency has the project of sending spacecrafts built by students to orbit around the Earth and the Moon. The spacecrafts are called European Student Earth and Moon Orbiters (ESEO and ESMO). In order to point towards the Earth for communications, towards the Sun to get energy using solar panels, and to the Earth and the Moon to take pictures, these spacecraft need a way of positioning themselves. This is done using a star tracker, a camera that looks at the stars, identifies them and their orientation, and infers the orientation of the spacecraft. My goal, along with a student team, was to solidify the design of the star trackers for ESEO and ESMO. About 20 other teams from universities all over Europe took care of other systems, such as the power or the propulsion of the spacecrafts.